Alkadyne HDF145B is outstanding for the production of large diameter, thick walled pipes (>100mm wall thickness). Exceptional melt strength results in ultra low sag extrusion performance making even the most challenging pipe dimensions possible using existing vacuum sizing extrusion technology. 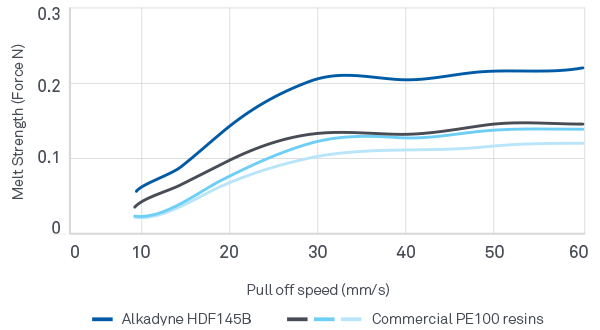 Alkadyne HDF145B expands the range of appplications for PE pipes into new frontiers and brings a proven track record in large scale projects. The exceptional melt strength performance means Alkadyne HDF145B is capable of producing pipe of wall thickness greater than 80mm. 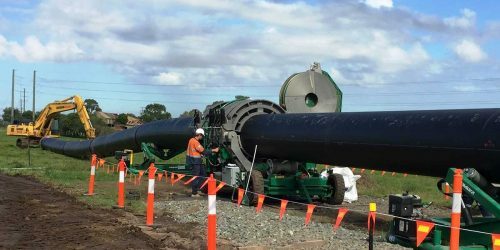 This opens up new applications to PE100 pipe and allows manufacturers to access new markets. Designers are able to consider using PE100 in applications usually reserved for steel and concrete. The market leading extrusion performance of Alkadyne HDF145B allows pipe extruders to increase outputs and efficiency. Production capacity can be expanded through the higher extrusion rates enabled by the properties of HDF145B. Cooling limited sites can substantially increase line speed.